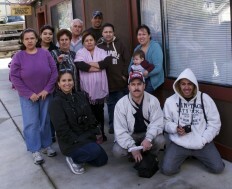 Gallery Route One’s Latino Photography Project embraces two programs, an adult photography class and classes for youth (grades 6 through 12) as an in school elective and an afterschool lab. The Latino Photography Project, launched in 2003, was an answer to the gallery’s question: How do we engage creatively with the twenty per cent of the West Marin population who are Latino? We began with a photography/literacy class taught by Luz Elena Castro which led to yearly exhibitions around a documentary theme. Over the following years, the class has taken on the issues of the immigrant experience, Main Street, housing, sustainability, bridge-building, food and culture and the environment. Student photographs appear regularly in the local paper, and smaller selections of photos travel to numerous other sites and satellite shows throughout the county. To see more work by each photographer, visit our Gallery of Latino Photography Students. In 2008, with “La Vida: Trabajo y Familia” (“The Life: Work and Family”), the group focused exclusively on Latino life that is largely hidden from view out on the dairy ranches and in the cheese factories. Returning to this theme, we are able to gather from the other years’ work and expand upon a portrait of the immigrant experience from the agrarian Mexican provinces of Jalisco, Michoacan, and Oaxaca to the ranches of West Marin at the turn of this century. In bi-lingual texts, each photographer tells about the work, the 60 or 70 hour weeks, the all night shifts, as well as the ongoing religious and family celebrations — baptisms, birthdays, weddings, and Aztec rites and dancing. A picture emerges of how continuous back-breaking labor is carried by familial, communal, and religious bonds that are celebrated on weekends in garages, rented halls, or the church. Luz Elena Castro, a Colombian-born photojournalist, inaugurated the project and taught the class for eight years. Currently a team of local professional photographers have been teaching technique through their areas of specialization. Advanced adult students are now teaching others. The photographers feel a sense of purpose both in documenting a significant moment in the histories of Mexico and the United States, the large Mexican diaspora, and in knowing that they, as adults raised in Mexico, still carry the old knowledge of farming, plants, culture, and ritual, even as their children become rapidly absorbed into 21st century America. 2005: Who Opens the Doors of the Town in the Morning?